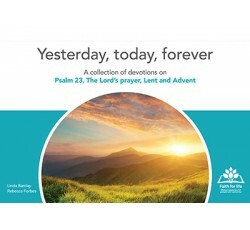 Yesterday, today, forever is part of the Faith for life collection (Devotional series) and provides a collection of devotions on Psalm 23, The Lord's prayer, Lent and Advent. Yesterday, today, forever is an A4 landscape A-frame desktop product with 68 pages featuring a beautiful, reminiscent image facing one way, with devotional ideas and prompts facing the other (e.g. a carer could sit the product on a table between themselves and a person with dementia to do the devotions). There are total of 29 devotions across the four themes covering some of the best-loved and well-known Scripture passages and events on the Christian calendar (Easter and Christmas). The A-frame's pages are printed on a special polymer stock which feel like paper but is tear and mark resistant.